Current influenza vaccines elicit Abs to the hemagglutinin and neuraminidase envelope proteins. Due to antigenic drift, these vaccines must be reformulated annually to include the envelope proteins predicted to dominate in the following season. By contrast, vaccination with the conserved nucleoprotein (NP) elicits immunity against multiple serotypes (heterosubtypic immunity). NP vaccination is generally thought to convey protection primarily via CD8 effector mechanisms. However, significant titers of anti-NP Abs are also induced, yet the involvement of Abs in protection has largely been disregarded. To investigate how Ab responses might contribute to heterosubtypic immunity, we vaccinated C57BL/6 mice with soluble rNP. This approach induced high titers of NP-specific serum Ab, but only poorly detectable NP-specific T cell responses. Nevertheless, rNP immunization significantly reduced morbidity and viral titers after influenza challenge. Importantly, Ab-deficient mice were not protected by this vaccination strategy. Furthermore, rNP-immune serum could transfer protection to naive hosts in an Ab-dependent manner. Therefore, Ab to conserved, internal viral proteins, such as NP, provides an unexpected, yet important mechanism of protection against influenza. These results suggest that vaccines designed to elicit optimal heterosubtypic immunity to influenza should promote both Ab and T cell responses to conserved internal proteins. Influenza virus causes acute respiratory illness that leads to ∼94,000 hospitalizations (1) and 36,000 deaths annually in the United States (2). Vaccines against influenza have been available for many years and are often highly effective at preventing infection as well as reducing morbidity and mortality associated with seasonal influenza outbreaks. Current vaccines are designed to elicit Abs directed against the external glycoproteins of influenza virus: hemagglutinin (HA)4 and neuraminidase (NA). Anti-HA Abs prevent influenza virus infection of cultured epithelial cells (neutralization) and can passively protect mice from infection (3, 4). In fact, neutralizing Ab titers are considered to be the gold standard correlate of vaccine-induced immunity and are presumed to provide the mechanism for vaccine-induced protection (5, 6, 7). Despite the efficacy of neutralizing Abs, their utility is limited, since they only protect against viral serotypes that express the same HA and NA proteins contained in the vaccine. Because mutations rapidly accumulate in the HA and NA proteins of influenza virus, particularly in the epitopes recognized by neutralizing Abs, influenza vaccines must be reformulated each year to include the HA and NA proteins predicted to dominate in the following influenza season. Consequently, generating annual vaccines is cumbersome and costly and if serotypes are not accurately predicted, the resulting immunity may not be very effective. By contrast, vaccines that elicit immunity to conserved, often internal viral proteins, such as nucleoprotein (NP), provide some protection from multiple subtypes of influenza virus. Mice vaccinated with influenza NP (as purified protein or using DNA expression vectors) have higher frequencies of NP-specific CD8 T cells before infection, as well as lower viral titers after challenge with H3N2 and H1N1 strains of influenza virus. This vaccination also protects from virus-induced lethality (8, 9, 10, 11, 12, 13), including lethality induced by highly pathogenic H5N1 human isolates (14). T cell responses to conserved epitopes of NP are thought to be the main mechanism of protection, because restimulated T cells can transfer protection to naive mice (15, 16) and because T cell depletion in the vaccinated mice can abrogate protection (14, 15). As a result, many investigations have focused on targeting Ags to the MHC class I pathway (e.g., using DNA-based vectors) to elicit CD8 T cell responses. Although CD4 and CD8 T cells can each contribute to protection elicited by vaccination with NP, T cells appear to be dispensable in some situations (13, 17), suggesting that other mechanisms, such as Ab production, may also contribute. Both natural infection with influenza virus and vaccination with recombinant NP elicit NP-specific Abs (18, 19). However, anti-NP Abs have been considered to be ineffective because they do not neutralize virus and because passive transfer of such Abs does not protect naive immunodeficient scid recipient mice (4). However, it has recently been shown that immune complexes formed with anti-NP mAbs can promote dendritic cell maturation, Th1 cytokine production, and anti-influenza CD8+ CTL responses in naive immunocompetent recipients (20). Additionally, anti-NP IgG can stimulate complement-mediated lysis of influenza-infected P815 mastocytoma cells in vitro, due to presence of NP on the cell surface (21). Furthermore, non-neutralizing Ab to HIV-1 can promote complement-mediated virolysis (22) and non-neutralizing Abs to Coxsackie B4 and poliovirus can induce secretion of the antiviral cytokine IFN-α from human monocytes (23, 24, 25). Based on these data, it is clear that non-neutralizing Abs have the potential to elicit antiviral responses. However, the antiviral potential of non-neutralizing anti-NP Abs in vivo, particularly in T cell-competent mice, has remained largely unexplored. Interestingly, our laboratory recently showed that immune serum from C57BL/6 mice infected with an H3N2 strain of influenza virus can passively promote viral clearance and reduce morbidity in immune B cell-deficient μMT mice after challenge with a heterosubtypic H1N1 strain (19). Abs in H3N2-immune serum do not cross-react with the H1 or N1 proteins and do not detect the external domain of M2 (M2e), suggesting that Abs against surface epitopes of influenza virus are not involved in the protective effect. By contrast, H3N2-immune serum has high titers of Ab reactive with NP (19), consistent with previous observations (26, 27, 28, 29, 30). These data suggest that anti-NP Abs play an important role in mediating cross-reactive protection against multiple serotypes and subtypes of influenza. Despite the potentially beneficial effects of anti-NP suggested by all of these studies, it is unknown whether these Abs are responsible for and can confer protection from influenza virus. Given the dire need for improving cross-protective vaccination strategies against this disease, it is critical to fully understand how immunization with this conserved protein confers protection. In this study, we show that Ab is necessary for NP immunization to confer protection in C57BL/6 mice and that NP-immune serum can transfer protection to naive recipient mice. Our results challenge the existing paradigm that T cell responses to conserved epitopes in internal proteins are the exclusive effectors of cross-reactive immunity to heterosubtypic strains of influenza virus and strongly suggest that Abs to these proteins are also an important component of the protective mechanism. Recombinant NP protein was produced and purified as previously described (19). Briefly, the NP gene of influenza A/PR8/34 (PR8) was cloned into the pTricHis2c plasmid for expression in Escherichia coli. 6X His-tagged rNP protein was affinity-purified via the ProBond purification system (Invitrogen). Resulting protein was dialyzed into PBS and sterile-filtered. All mice were on the C57BL/6 background and were bred and maintained at the Trudeau Institute. C57BL/6, B6.129P2-Cd40tm1Kik/J (CD40−/−), and B cell-deficient B6.129S2-Igh-6tm1Cgn/J (μMT) mice were obtained from The Jackson Laboratory. Aid−/− mice were obtained from Dr. R. Gerstein (University of Massachusetts Medical School; Worchester, MA). Mice lacking the secretory exon of IgM (μS−/− mice) were obtained from Dr. R. Corley (Boston University; Boston, MA). Aid−/− and μS−/− mice were intercrossed to generate Ab-deficient AID/μS mice. Mice were immunized i.p. with combinations of 20 μg of LPS with or without 30 μg of rNP at days 0 and 10. For influenza infections, mice were anesthetized with isofluorane USP (Webster Veterinary) and 500 egg infectious units (EIU) (0.2 LD50) of influenza PR8 were administered intranasally in 100 μl of sterile PBS. All procedures involving live animals were approved by the Trudeau Institute Institutional Animal Care and Use Committee and were performed in accordance with guidelines set by the National Research Council. Madin-Darby canine kidney cells were grown in 96-well, flat-bottom plates until just confluent and then washed with HBSS. Homogenized lung samples were diluted in Zero Serum Media (Diagnostic Hybrids) supplemented with 4 μg/ml trypsin and applied to washed Madin-Darby canine kidney cells. Plates were centrifuged for 1.5 h at 800 × g, washed, and cultured overnight in Zero Serum Media/trypsin at 33°C. The medium was removed and the cells were fixed with 80% acetone and allowed to dry. The wells were rehydrated with PBS, containing 2% FBS and 0.01% NaN3, and probed with mouse anti-influenza A Ab (Chemicon International). The primary Ab was detected with biotinylated goat anti-mouse IgG (Chemicon International) followed by alkaline phosphatase-conjugated streptavidin (DakoCytomation). Viral foci were developed by incubating for 30 min with 5-bromo-4-chloro-3-indolyl phosphate and NBT tablets (Sigma Fast BCIP/NBT; Sigma-Aldrich) dissolved in H2O. The resulting foci were counted under a dissecting microscope. Data were analyzed for significance by Student’s t test. Mice were sacrificed at the indicated times after infection and tissues were removed and mechanically disrupted by passage through wire mesh. Resultant cell suspensions were RBC-lysed and mesh-filtered. Cells were incubated in 3% FBS in PBS containing 10 μg/ml 2.4G2 to block Fc receptor binding, followed by staining with fluorochrome-conjugated CD8, CD62L (BD Biosciences), and MHC class I tetramers presenting NP366–374 or PA224–233 peptides (Trudeau Institute Molecular Biology Core Facility). Samples were analyzed with a FACSCalibur flow cytometer (BD Biosciences). Peripheral blood was obtained from either euthanized mice by severing the renal artery and pipetting into a 1.5-ml tube or from live mice via the lateral tail vein. After clotting for 30 min at 37°C, the precipitate was pelleted in a microcentrifuge and the serum was collected. NP-specific ELISAs were performed by coating plates with 2 μg/ml rNP. Serum samples were diluted in 3-fold serial dilutions in PBS with 10 μg/ml BSA and 0.1% Tween 20 before incubation on coated plates. Bound Ab was detected with HRP-conjugated goat anti-mouse IgM or goat anti-mouse IgG (Southern Biotechnology Associates). To induce high titers of NP-specific Ab, we purified soluble rNP to use as an immunogen. This protein runs as a single band of ∼53 kDa on a reducing SDS-PAGE gel (Fig. 1⇓A). We i.p. immunized C57BL/6 mice with either 30 μg of purified rNP (plus 20 μg of LPS as an adjuvant that is known to stimulate strong B cell responses) or with LPS alone on days 0 (prime) and 10 (boost). This vaccination alone did not induce a NP-specific CD8 T cell response that was detectable by MHC class I tetramer staining and flow cytometry at various times after boosting (Fig. 1⇓B and data not shown). However, the vaccination clearly induced high titers of NP-specific Ab in the serum as late as 39 days after priming (Fig. 1⇓C). Thus, as expected, immunization with soluble rNP promotes a robust Ab response, but a limited CD8 T cell response. Immunization with purified rNP protects C57BL/6 mice from influenza-induced morbidity and reduces viral titers. A, Five hundred nanograms of affinity-purified, sterile-filtered C-terminal 6X histidine-tagged rNP was fractionated using SDS-PAGE under reducing conditions and stained with Coomassie blue. B, C57BL/6 mice were vaccinated i.p. with 30 μg of rNP and 20 μg of LPS or with LPS alone on days 0 and 10. On day 39, animals were euthanized and CD8+ NP-specific T cells in spleen and lung were analyzed by flow cytometry. Cell populations in the displayed plots were gated on propidium iodide-negative, CD8-positive cells. Cell suspensions of spleen and lung from day 10 influenza-infected mice were analyzed as positive controls. (Plot shown is one of five similar plots from five mice per group.) C, Sera from mice vaccinated as in B were assayed for NP-specific Ab by ELISA. Mean ± SD of five mice per group. D, C57BL/6 mice were vaccinated i.p. with 30 μg of rNP and 20 μg of LPS or with LPS alone on days 0 and 10. Vaccinated mice were challenged i.n. on day 40 with 500 EIU of PR8. Mice were weighed before infection, and the change in body weight was calculated as percentage of initial weight. Mean ± SD of five mice per group. E, Mice were immunized and infected as in D. Lung viral titers were assayed 8 days after influenza challenge. Representative of at least five similar experiments. To determine whether this apparently Ab-biased vaccine could still confer protection from an influenza virus challenge, the immunized mice were intranasally (i.n.) infected with a nonlethal dose of influenza PR8 virus (500 EIU, ∼0.2 LD50) 1 mo after the boost (day 40 after priming). Mice immunized with LPS alone lost ∼15% body weight by day 7 postinfection and had not yet recovered to their initial starting weight by day 11 (Fig. 1⇑D). By contrast, mice vaccinated with rNP/LPS lost <5% of their initial weight and fully recovered by day 11 (Fig. 1⇑D). The reduced morbidity in rNP-vaccinated mice was associated with significantly lower viral titers in the lungs on day 8 after infection (Fig. 1⇑E). Therefore, as previously described (11, 31), immunization of C57BL/6 mice with rNP provides some measure of protection from sublethal challenge. Although we immunized our mice in a manner that would bias the immune response to produce high-titer Ab, it remained possible that soluble rNP could be cross-presented on MHC class I to generate a memory CD8 T cell population that was undetectable before virus challenge. We therefore used flow cytometry to enumerate the influenza-specific CD8 T cell response after virus infection. 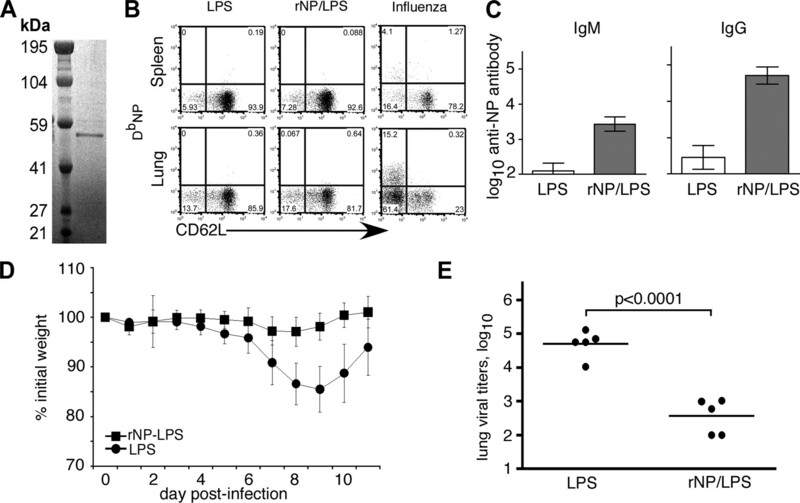 On day 7 after challenge infection, there was a modestly greater number of NP-specific CD8 T cells in the lungs of rNP/LPS-vaccinated mice than in the lungs of LPS-vaccinated mice (Fig. 2⇓A). However, after day 7, NP-specific CD8 T cells in the lungs of rNP-vaccinated mice declined, whereas the number of these cells in the lungs of LPS-vaccinated controls continued to increase through days 9 and 10 (Fig. 2⇓A). As a comparison, we also analyzed the numbers of CD8 T cells specific for the acidic polymerase (PA), since these cells should not be directly affected by vaccination with rNP (32, 33). As we expected, the expansion of PA-specific CD8 T cells in the LPS-immunized control mice was similar to that of the NP-specific CD8 T cells. However, the expansion of PA-specific CD8 T cell responses also peaked earlier (day 7), although at lower numbers in the lungs of rNP/LPS-vaccinated mice than in LPS-vaccinated controls (Fig. 2⇓B). Similarly to NP-specific cells, the PA response was substantially reduced in rNP-immune mice subsequent to day 7. Because both NP- and PA-specific CD8 T cell responses were lower in the NP-vaccinated mice compared with mock-vaccinated mice, these results suggest that the primary T cell response to influenza virus was altered in the rNP-immune mice, likely due to less Ag available to stimulate these cells, as demonstrated in Fig. 1⇑. 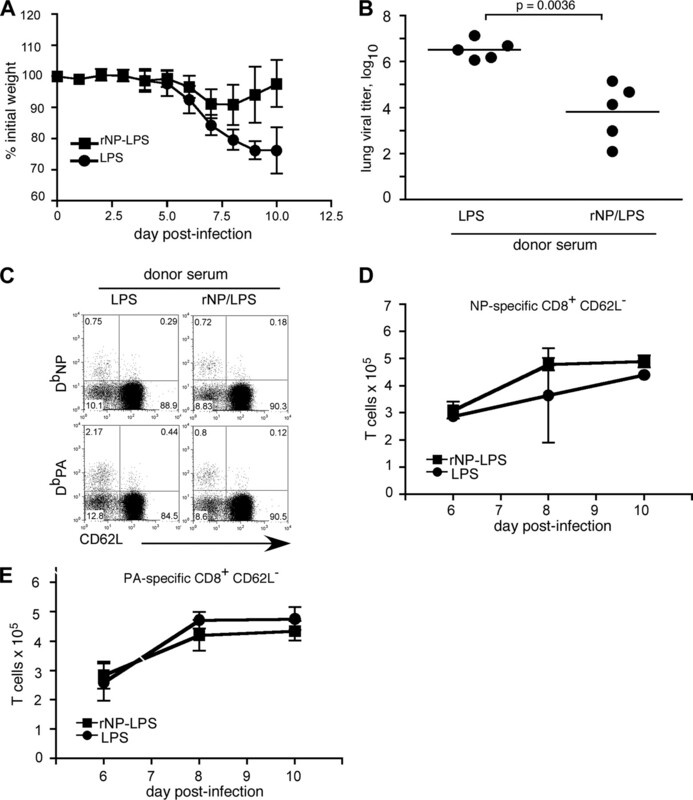 rNP immunization alters the kinetics of the CD8 T cell response after viral challenge. C57BL/6 mice were vaccinated i.p. with 30 μg of rNP and 20 μg of LPS or with LPS alone on days 0 and 10 and challenged with 500 EIU of PR8 on day 40. NP-specific (A) and PA-specific (B) CD8 T cells in the lung were measured by flow cytometry on the indicated day subsequent to challenge infection. NP-specific (C) and PA-specific (D) CD8 T cells were measured in the spleen. Mean ± SD of five mice per group. Representative of at least three similar experiments. With little apparent acceleration of the CD8 T cell response in the lungs of rNP-immune mice, we also examined the spleen. NP-specific CD8 T cells appeared 1 day earlier and peaked at higher numbers in rNP-immune mice relative to LPS-vaccinated controls (Fig. 2⇑C). By contrast, the kinetics and magnitude of the splenic PA-specific CD8 T cell response was unaffected by rNP vaccination (Fig. 2⇑D). Therefore, at the site of infection, the numbers of NP-specific CD8 T cells were increased at an early time point, suggesting a modest recall T cell response. However, the early viral clearance (Fig. 1⇑E and data not shown), and thereby limiting Ag, likely prevents further expansion of these cells and expansion of newly responding influenza-specific CD8 T cells in the lung. Our laboratory previously showed that CD40 expression is required for optimal CD8 T cell responses to influenza virus (34). Thus, if CD8 T cells were contributing to rNP-immune protection, we would expect that rNP immunization would be ineffective in the absence of CD40 expression. 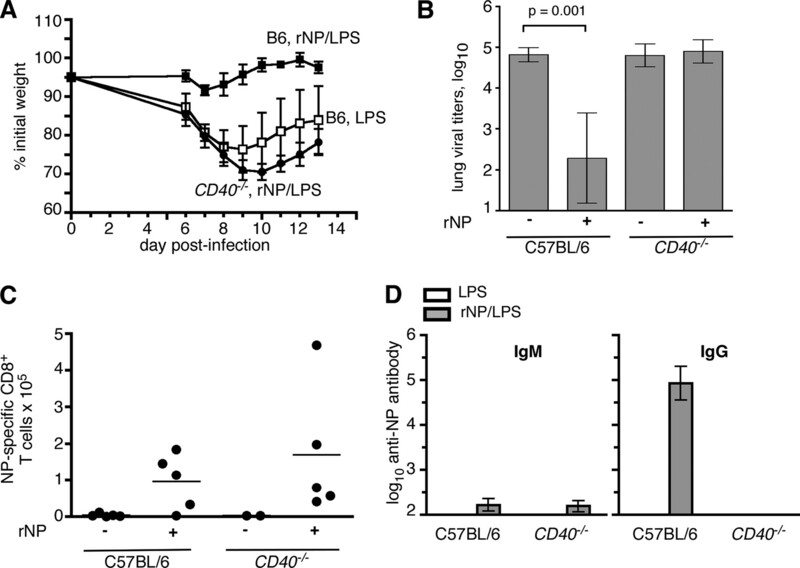 Indeed, whereas C57BL/6 mice vaccinated with rNP/LPS lost very little weight after challenge infection, rNP-immune CD40−/− mice lost as much weight as LPS-vaccinated C57BL/6 mice (Fig. 3⇓A). Furthermore, rNP vaccination did not reduce lung viral titers in CD40−/− mice as in the controls (Fig. 3⇓B). Thus, a protective immune response to vaccination with rNP/LPS requires CD40. However, the early NP-specific CD8 T cell response in the lung was observed in rNP-immune CD40−/− mice as well as in rNP-immune C57BL/6 mice, in comparison to LPS-immunized controls (Fig. 3⇓C). Therefore, although an early CD8 T cell recall response occurs in the lung of rNP-immune mice, this response alone appears to be insufficient to protect mice that do not express CD40. rNP-elicited protection from influenza requires CD40. C57BL/6 and CD40−/− mice were vaccinated i.p. with either 30 μg of rNP and 20 μg of LPS or with LPS alone on days 0 and 10. All groups were challenged i.n. with 500 EIU of PR8 on day 40. A, Relative body weights were determined. Mean ± SD of five mice per group. B, Viral titers were assayed in the lung at day 8 postinfection. Mean ± SD of five mice per group. C, NP-specific CD8 T cells in the lung were determined by flow cytometry on day 7 postinfection. D, Serum titers of NP-specific IgM and IgG were measured by ELISA in vaccinated mice on day 39 (1 day before infection). Mean ± SD of five mice per group. Representative of at least three similar experiments. Because CD40 expression is required for rNP-immune protection, but not for early CD8 T cell responses in our system (Fig. 3⇑, A–C), we hypothesized that another CD40-regulated effector function was necessary. CD40 is essential for effective induction of germinal center reactions to protein Ags (35, 36) and for the accompanying class-switched, high-affinity, and long-lived Ab responses (37). In fact, rNP-immune CD40−/− mice had little to no NP-specific IgG in the serum (Fig. 3⇑D). These results show that protection induced by rNP correlates with serum titers of NP-specific Ab. To determine whether the loss of protection in the CD40−/− mice was due to the failure to generate Ab, we crossed mice with a mutation in activation-induced cytidine deaminase (Aid −/−) (38) with mice lacking the secretory form of IgM (μS−/−) (39). Because Aid −/− mice cannot isotype switch their Ab genes and μS−/− mice cannot secrete IgM, the resulting AID/μS mice have B cells, but cannot secrete Ab of any isotype. We vaccinated C57BL/6 and AID/μS mice with rNP/LPS or with LPS alone and challenged them with influenza virus on day 40. Fig. 4⇓A shows that, even after vaccination and influenza infection, AID/μS mice do not generate any NP-specific Abs compared with vaccinated and infected C57BL/6 mice. As observed earlier, rNP-immune C57BL/6 mice had significantly lower viral titers than LPS-vaccinated controls on day 8 postinfection (Fig. 4⇓B). However, rNP-immune, Ab-deficient AID/μS mice had viral titers that were as high as those in LPS-vaccinated control mice. Importantly, rNP-immune AID/μS mice still had an enhanced NP-specific CD8 T cell response that was still detectable at day 8 postinfection, when the modest recall response in the rNP-immune C57BL/6 mice had declined (Fig. 4⇓C). It is likely that the higher Ag load (Fig. 4⇓B) extends the expansion of existing memory T cells in the AID/μS mice, whereas the Ab in rNP-immune C57BL/6 mice prevents further expansion by promoting viral clearance. These results directly demonstrate that Abs are essential for rNP-elicited protection from influenza virus. rNP vaccination-mediated reduction in viral titers requires Ab. C57BL/6 and Ab-deficient AID/μS mice were immunized i.p. with either 30 μg of rNP and 20 μg of LPS or with LPS alone on days 0 and 10. All groups were subsequently challenged i.n. with 500 EIU of PR8 on day 40, and analyzed 8 days later. A, Titers of NP-specific IgM and IgG were measured by ELISA in serum. Mean ± SD of five mice per group. The low titers of anti-NP IgM in C57BL/6 mice are not consistently detected among experiments performed at this time point. B, Lung viral titers were measured. C, NP-specific CD8 T cells in the lung were determined by flow cytometry. Representative of two similar experiments. Although a previous study demonstrated that transfer of monoclonal anti-NP Abs to scid mice did not protect from influenza virus (4), it was possible that these Abs would be protective if T cells were also present. To test this possibility, we transferred serum from rNP-vaccinated C57BL/6 donors to μMT mice and challenged the B cell-deficient recipients with influenza virus the following day. Whereas recipients of LPS-immune serum continued to lose up to 25% of initial body weight through day 10 after infection, μMT mice receiving rNP-immune serum lost only ∼10% of their body weight and began to recover by day 8 (Fig. 5⇓A). Moreover, lung viral titers on day 10 were reduced by ∼100-fold in recipients of rNP-immune serum relative to those in mice that received control serum (Fig. 5⇓B). Therefore, rNP-immune serum can convey protection against influenza challenge in T cell-competent μMT hosts. rNP-immune serum protects μMT mice against influenza-induced morbidity. Serum was obtained on day 40 from C57BL/6 mice vaccinated with either 30 μg of rNP and 20 μg of LPS or with LPS alone at days 0 and 10. Two hundred microliters of sera was injected i.p. into naive μMT mice 1 day before influenza PR8 infection (500 EIU). A, Mice were weighed daily and relative body weights were determined. Mean ± SD of five mice per group. B, Lung viral titers were determined on day 10 postinfection. C, Flow cytometry of spleen cells was performed on day 8 postinfection. Values shown are percentage of the CD8+ gate. D, Kinetics of the NP-specific CD8 T cell response in the spleen. Mean ± SD of five mice per group. The total number of NP-specific CD8 T cells per spleen was calculated from flow cytometry data as in C. Representative of at least three similar experiments. E, Kinetics of the PA-specific CD8 T cell response in the spleen. Mean ± SD of five mice per group. The total number of NP-specific CD8 T cells per spleen was calculated from flow cytometry data as in C.
We next tested whether the transfer of rNP-immune serum affected CD8 T cell responses. The frequency of NP-specific CD8 T cells in the spleen was not significantly different in recipients of rNP-immune serum compared with control serum, and the frequency of PA-specific CD8 T cells was slightly lower in mice that received rNP-immune serum (Fig. 5⇑C). Furthermore, the overall kinetics and magnitude of the CD8 T cell response in these mice remained largely unaffected compared with mice that received control serum (Fig. 5⇑, D and E). Thus, the protection provided by rNP-immune serum does not correlate with a detectable modification of the CD8 T cell response. To demonstrate that the protection conveyed by rNP-immune serum transfer is Ab-mediated, we immunized C57BL/6 and Ab-deficient AID/μS mice with rNP/LPS, transferred serum from these animals to naive μMT recipients, and challenged them with influenza virus the following day. Recipients of rNP-immune serum from C57BL/6 mice lost only ∼15% of their initial body weight and were recovering by day 11 postinfection; however, mice that received serum from rNP-immune AID/μS mice still lost >25% body weight and showed no recovery effects comparable to recipients of C57BL/6 control serum (LPS) (Fig. 6⇓A). Additionally, rNP-immune serum from the AID/μS donors failed to reduce lung viral titers (Fig. 6⇓B). These results clearly demonstrate that the protection against influenza infection conveyed by rNP-immune serum transfer is dependent upon Ab. Protection of μMT mice by transfer of rNP-immune serum requires Ab. Serum was obtained from rNP/LPS-vaccinated C57BL/6 mice, rNP/LPS-vaccinated AID/μS mice, and LPS-vaccinated C57BL/6 mice 40 days after vaccination. Two hundred microliters of serum was transferred to μMT mice 1 day before i.n. challenge with 500 EIU of influenza PR8. A, Body weights were measured daily and relative body weights were determined. Mean ± SD of five mice per group. B, Viral titers were measured in the lungs of the recipient mice on day 10 postinfection. Representative of two similar experiments. Finally, to address why previous studies found no protective effect of NP-specific Abs in scid mice (4), we transferred rNP-immune serum into mice deficient in recombination-activating gene-1 (Rag1−/−), which, similar to scid mice, lack both B cells and T cells due to a requirement for this enzyme during lymphopoiesis (40). 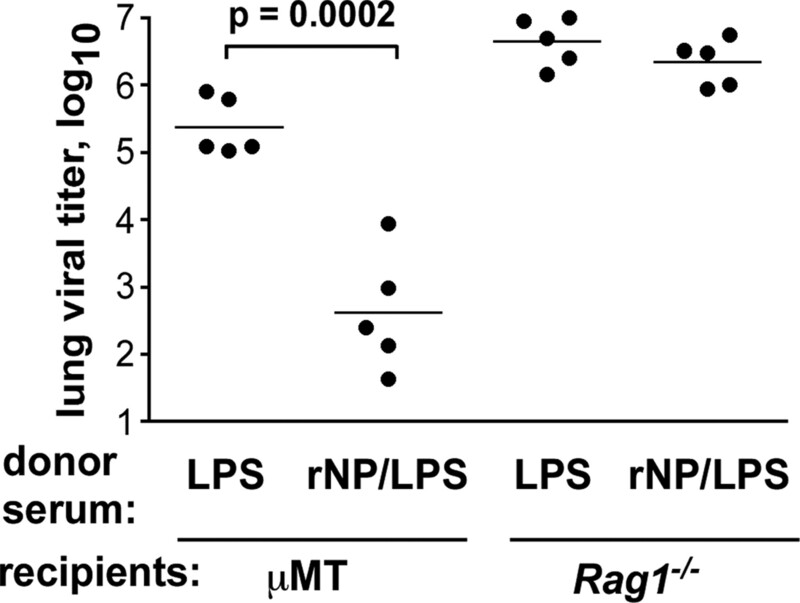 In contrast to μMT recipients, which lack mature B cells, but have T cells, Rag1−/− mice that received rNP-immune serum had the same amount of virus in the lung on day 10 compared with mice receiving control serum (Fig. 7⇓). This result clearly demonstrates that T lymphocytes are required for immune protection conferred by NP-immune Ab. Transfer of rNP-immune serum protects T cell-sufficient, but not T cell-deficient recipients. Serum was obtained from rNP/LPS-vaccinated or LPS-vaccinated 40 days after vaccination. Three hundred microliters of serum was transferred to μMT or to Rag1−/− mice 1 day before i.n. challenge with 500 EIU of influenza PR8. Viral titers were measured in the lungs of the recipient mice on day 10 postinfection. Representative of two similar experiments. Collectively, these findings establish that Ab, in combination with T lymphocytes, is a crucial effector underlying the protection elicited by rNP vaccination. Furthermore, the results reveal a novel and important role for non-neutralizing polyclonal Ab to internal, conserved viral proteins in vaccine-mediated protection. Current influenza vaccines are designed to elicit neutralizing Ab responses to external, mutation-prone molecules such as HA and NA. However, these vaccines must be reformulated annually to account for antigenic drift, and they fail to provide significant protection when the HA and NA proteins of the circulating virus are substantially different than those in the vaccine. An alternative strategy is to vaccinate with highly conserved internal influenza proteins, such as NP. Our data confirm that NP vaccination alleviates morbidity and reduces viral load when the vaccinated C57BL/6 mice are challenged with live influenza virus. Although we immunized with a soluble protein Ag, we observed a modest acceleration of the NP-specific CD8 T cell response in the lung and spleen, suggesting that the Ag was cross-presented and generated a memory precursor pool. However, a rapid CD8 T cell expansion per se cannot be entirely responsible for protection in these experiments, as CD40−/− and AID/μS mice, which make defective Ab responses, were not protected by rNP vaccination, despite the presence of responding NP-specific memory CD8 T cells in the lung. Furthermore, transferred rNP-immune serum reduces influenza-induced morbidity and viral load in an Ab-dependent fashion in otherwise naive μMT recipients, but not in naive Rag1−/− recipients. Together, these data indicate that Abs play an unexpectedly important role in immune protection elicited by vaccination with rNP. Despite high titers of specific Ab generated by NP vaccination (9, 14, 17, 31, 41), the potential for these Abs to facilitate influenza resistance has been underappreciated. In part, this disregard is due to early studies that failed to show protective effects of NP-specific Abs in lymphopenic scid (4) and in BALB/c recipients (9). These results solidified the paradigm that non-neutralizing Abs to NP do not contribute to protective immunity from influenza virus. We have found that B cell-deficient μMT mice can be protected by heterosubtypic immune serum (19) and, more specifically, by rNP-immune serum in an Ab-dependent manner (Figs. 5–7⇑⇑⇑). Compared with control mice such as C57BL/6, μMT mice are much more susceptible to the pathogenic effects of influenza, likely due to poor Ab responses to the virus (42), as well as a lack of influenza-reactive natural Ab (43). Thus, the protective effects that we transfer with a single dose of rNP-immune sera are readily observable in the absence of endogenous Ab responses. By contrast, intact recipient mice may require larger amounts of anti-NP Ab comparable to the titers observed in actively immunized C57BL/6 (Figs. 1⇑ and 3⇑) and BALB/c mice, which are each protected by NP vaccination (Ref. 9 and data not shown). The failure to protect lymphopenic scid recipient mice with monoclonal anti-NP Ab in a previous report (4) is likely due to the absence of T cells. Importantly, we show that our polyclonal rNP-immune serum can protect T cell-sufficient μMT mice, but not T cell-deficient Rag1−/− mice (Fig. 7⇑). This result not only explains the previous failure of anti-NP to protect lymphopenic scid recipients (4), but also demonstrates that T lymphocytes are an important component of the antiviral mechanism mediated by these Abs. The nature of the participating T cells, whether a characteristic of the CD8 response that was not detected or another T cell subset remains to be determined. Our data add to growing evidence that non-neutralizing Abs can contribute to protection from influenza challenge via multiple mechanisms (17, 19, 44, 45). Another reason that the protective potential of anti-NP Abs has been dismissed is the assumption that effective Ab must neutralize virus and prevent its attachment to host cells. However, the Fc region of an Ab can activate a variety of antiviral effector functions (22, 24, 25, 46, 47, 48, 49). In fact, non-neutralizing anti-influenza Abs, including anti-NP, have been shown to induce complement-mediated cytolysis (21), increased T cell responses associated with enhanced dendritic cell function (20), and reduced viral replication in culture (45). Furthermore, NP-LPS immunostimulating complexes given orally were shown to provide protection against virulent influenza challenge (50). This protection correlated with high serum and bronchoalveolar lavage Ab titers, particularly IgA, and no CTL response was detected in the spleen or lung of challenged animals. Although no causal relationship was demonstrated, the results suggest that additional mechanisms may function depending upon the vaccine strategy and route of delivery. Therefore, NP-immune Ab in our model may be promoting early viral clearance through various mechanisms. Influenza NP is internal to the virion and internal to influenza-infected cells (51). Thus, it is not readily apparent how anti-NP Abs in vaccinated mice would encounter this Ag. Nonetheless, anti-NP Abs are eventually generated during natural influenza virus infection (18, 19), indicating that this Ag is somehow exposed to the humoral immune system. This exposure may be via NP released from dying infected cells (52) or by its expression on the plasma membrane (53, 54). Therefore, interaction of vaccine-induced anti-NP Abs with this NP early in the infection likely triggers downstream effector mechanisms that blunt virus replication, slow progression of the infection, and reduce morbidity. In summary, our data clearly demonstrate that anti-NP Abs are essential for rNP-derived protection and that rNP-immune serum can convey this protection to naive recipients. Importantly, these results show that a humoral immune response to a single, conserved, internal protein of influenza virus makes a significant contribution to protection. This information greatly enhances our understanding of how current influenza vaccines could be improved to provide cross-protective immunity in humans. If long-lived, this cross-protection would considerably reduce the effort and cost of providing annual immunizations, the cost of caring for infected individuals, and possibly provide a level of population immunity that would curtail the spread of pandemic influenza. We thank Drs. Rachel Gerstein and Ronald Corley for providing mutant mice and Drs. Frances Lund, Ravi Misra, and Javier Rangel-Moreno for helpful discussions and for reading this manuscript. ↵1 This study was supported by National Institutes of Health Grants AI061511 and AI072689 (to T.D.R.) and the Trudeau Institute. ↵2 D.M.C. and D.A.K. contributed equally to this work. ↵4 Abbreviations used in this paper: HA, hemagglutinin; NA, neuraminidase; NP, nucleoprotein; PA, acidic polymerase; i.n., intranasally; EIU, egg infectious unit. Palladino, G., K. Mozdzanowska, G. Washko, W. Gerhard. 1995. Virus-neutralizing antibodies of immunoglobulin G (IgG) but not of IgM or IgA isotypes can cure influenza virus pneumonia in SCID mice. J. Virol. 69: 2075-2081. Gerhard, W., K. Mozdzanowska, M. Furchner, G. Washko, K. Maiese. 1997. Role of the B-cell response in recovery of mice from primary influenza virus infection. Immunol. Rev. 159: 95-103. Kaiser, J.. 2006. A one-size-fits-all flu vaccine?. Science 312: 380-382. Nichol, K. L., J. J. Treanor. 2006. Vaccines for seasonal and pandemic influenza. J. Infect. Dis. 194: (Suppl. 2):S111-S118. Subbarao, K., B. R. Murphy, A. S. Fauci. 2006. Development of effective vaccines against pandemic influenza. Immunity 24: 5-9. Wraith, D. C., A. E. Vessey, B. A. Askonas. 1987. Purified influenza virus nucleoprotein protects mice from lethal infection. J. Gen. Virol. 68: 433-440. Ulmer, J. B., J. J. Donnelly, S. E. Parker, G. H. Rhodes, P. L. Felgner, V. J. Dwarki, S. H. Gromkowski, R. R. Deck, C. M. DeWitt, A. Friedman, et al 1993. Heterologous protection against influenza by injection of DNA encoding a viral protein. Science 259: 1745-1749. Endo, A., S. Itamura, H. Iinuma, S. Funahashi, H. Shida, F. Koide, K. Nerome, A. Oya. 1991. Homotypic and heterotypic protection against influenza virus infection in mice by recombinant vaccinia virus expressing the haemagglutinin or nucleoprotein of influenza virus. J. Gen. Virol. 72: 699-703. Tamura, S., K. Miyata, K. Matsuo, H. Asanuma, H. Takahashi, K. Nakajima, Y. Suzuki, C. Aizawa, T. Kurata. 1996. Acceleration of influenza virus clearance by Th1 cells in the nasal site of mice immunized intranasally with adjuvant-combined recombinant nucleoprotein. J. Immunol. 156: 3892-3900. Tite, J. P., C. Hughes-Jenkins, D. O'Callaghan, G. Dougan, S. M. Russell, X. M. Gao, F. Y. Liew. 1990. Anti-viral immunity induced by recombinant nucleoprotein of influenza A virus: II. Protection from influenza infection and mechanism of protection. Immunology 71: 202-207. Epstein, S. L., A. Stack, J. A. Misplon, C. Y. Lo, H. Mostowski, J. Bennink, K. Subbarao. 2000. Vaccination with DNA encoding internal proteins of influenza virus does not require CD8+ cytotoxic T lymphocytes: either CD4+ or CD8+ T cells can promote survival and recovery after challenge. Int. Immunol. 12: 91-101. Epstein, S. L., W. P. Kong, J. A. Misplon, C. Y. Lo, T. M. Tumpey, L. Xu, G. J. Nabel. 2005. Protection against multiple influenza A subtypes by vaccination with highly conserved nucleoprotein. Vaccine 23: 5404-5410. Ulmer, J. B., T. M. Fu, R. R. Deck, A. Friedman, L. Guan, C. DeWitt, X. Liu, S. Wang, M. A. Liu, J. J. Donnelly, M. J. Caulfield. 1998. Protective CD4+ and CD8+ T cells against influenza virus induced by vaccination with nucleoprotein DNA. J. Virol. 72: 5648-5653. Fu, T. M., L. Guan, A. Friedman, T. L. Schofield, J. B. Ulmer, M. A. Liu, J. J. Donnelly. 1999. Dose dependence of CTL precursor frequency induced by a DNA vaccine and correlation with protective immunity against influenza virus challenge. J. Immunol. 162: 4163-4170. Bender, B. S., W. E. Bell, S. Taylor, P. A. Small, Jr. 1994. Class I major histocompatibility complex-restricted cytotoxic T lymphocytes are not necessary for heterotypic immunity to influenza. J. Infect. Dis. 170: 1195-1200. Sukeno, N., Y. Otsuki, J. Konno, N. Yamane, T. Odagiri, J. Arikawa, N. Ishida. 1979. Anti-nucleoprotein antibody response in influenza A infection. Tohoku J. Exp. Med. 128: 241-249. Rangel-Moreno, J., D. M. Carragher, R. S. Misra, K. Kusser, L. Hartson, A. Moquin, F. E. Lund, T. D. Randall. 2008. B cells promote resistance to heterosubtypic strains of influenza via multiple mechanisms. J. Immunol. 180: 454-463. Zheng, B., Y. Zhang, H. He, E. Marinova, K. Switzer, D. Wansley, I. Mbawuike, S. Han. 2007. Rectification of age-associated deficiency in cytotoxic T cell response to influenza a virus by immunization with immune complexes. J. Immunol. 179: 6153-6159. Yewdell, J. W., E. Frank, W. Gerhard. 1981. Expression of influenza A virus antigens on the surface of infected P815 cells. J. Immunol. 126: 1814-1819. Chehadeh, W., A. Bouzidi, G. Alm, P. Wattre, D. Hober. 2001. Human antibodies isolated from plasma by affinity chromatography increase the Coxsackievirus B4-induced synthesis of interferon-α by human peripheral blood mononuclear cells in vitro. J. Gen. Virol. 82: 1899-1907. Palmer, P., B. Charley, B. Rombaut, M. Daeron, P. Lebon. 2000. Antibody-dependent induction of type I interferons by poliovirus in human mononuclear blood cells requires the type II Fcγ receptor (CD32). Virology 278: 86-94. Hober, D., W. Chehadeh, A. Bouzidi, P. Wattre. 2001. Antibody-dependent enhancement of Coxsackievirus B4 infectivity of human peripheral blood mononuclear cells results in increased interferon-α synthesis. J. Infect. Dis. 184: 1098-1108. Scherle, P. A., W. Gerhard. 1988. Differential ability of B cells specific for external vs. internal influenza virus proteins to respond to help from influenza virus-specific T-cell clones in vivo. Proc. Natl. Acad. Sci. USA 85: 4446-4450. Epstein, S. L., C. Y. Lo, J. A. Misplon, C. M. Lawson, B. A. Hendrickson, E. E. Max, K. Subbarao. 1997. Mechanisms of heterosubtypic immunity to lethal influenza A virus infection in fully immunocompetent, T cell-depleted, β2-microglobulin-deficient, and J chain-deficient mice. J. Immunol. 158: 1222-1230. Sealy, R., S. Surman, J. L. Hurwitz, C. Coleclough. 2003. Antibody response to influenza infection of mice: different patterns for glycoprotein and nucleocapsid antigens. Immunology 108: 431-439. Marshall, D., R. Sealy, M. Sangster, C. Coleclough. 1999. TH cells primed during influenza virus infection provide help for qualitatively distinct antibody responses to subsequent immunization. J. Immunol. 163: 4673-4682. Cox, R. J., E. Mykkeltvedt, J. Robertson, L. R. Haaheim. 2002. Non-lethal viral challenge of influenza haemagglutinin and nucleoprotein DNA vaccinated mice results in reduced viral replication. Scand. J. Immunol. 55: 14-23. Belz, G. T., W. Xie, J. D. Altman, P. C. Doherty. 2000. A previously unrecognized H-2Db-restricted peptide prominent in the primary influenza A virus-specific CD8+ T-cell response is much less apparent following secondary challenge. J. Virol. 74: 3486-3493. Crowe, S. R., S. J. Turner, S. C. Miller, A. D. Roberts, R. A. Rappolo, P. C. Doherty, K. H. Ely, D. L. Woodland. 2003. Differential antigen presentation regulates the changing patterns of CD8+ T cell immunodominance in primary and secondary influenza virus infections. J. Exp. Med. 198: 399-410. Lee, B. O., L. Hartson, T. D. Randall. 2003. CD40-deficient, influenza-specific CD8 memory T cells develop and function normally in a CD40-sufficient environment. J. Exp. Med. 198: 1759-1764. Xu, J., T. M. Foy, J. D. Laman, E. A. Elliott, J. J. Dunn, T. J. Waldschmidt, J. Elsemore, R. J. Noelle, R. A. Flavell. 1994. Mice deficient for the CD40 ligand. Immunity 1: 423-431. Foy, T. M., J. D. Laman, J. A. Ledbetter, A. Aruffo, E. Claassen, R. J. Noelle. 1994. gp39-CD40 interactions are essential for germinal center formation and the development of B cell memory. J. Exp. Med. 180: 157-163. Kawabe, T., T. Naka, K. Yoshida, T. Tanaka, H. Fujiwara, S. Suematsu, N. Yoshida, T. Kishimoto, H. Kikutani. 1994. The immune responses in CD40-deficient mice: impaired immunoglobulin class switching and germinal center formation. Immunity 1: 167-178. Muramatsu, M., K. Kinoshita, S. Fagarasan, S. Yamada, Y. Shinkai, T. Honjo. 2000. Class switch recombination and hypermutation require activation-induced cytidine deaminase (AID), a potential RNA editing enzyme. Cell 102: 553-563. Boes, M., C. Esau, M. B. Fischer, T. Schmidt, M. Carroll, J. Chen. 1998. Enhanced B-1 cell development, but impaired IgG antibody responses in mice deficient in secreted IgM. J. Immunol. 160: 4776-4787. Scheepers, K., H. Becht. 1994. Protection of mice against an influenza virus infection by oral vaccination with viral nucleoprotein incorporated into immunostimulating complexes. Med. Microbiol. Immunol. 183: 265-278. Baumgarth, N., O. C. Herman, G. C. Jager, L. E. Brown, L. A. Herzenberg, J. Chen. 2000. B-1 and B-2 cell-derived immunoglobulin M antibodies are nonredundant components of the protective response to influenza virus infection. J. Exp. Med. 192: 271-280. Nguyen, H. H., F. W. van Ginkel, H. L. Vu, J. R. McGhee, J. Mestecky. 2001. Heterosubtypic immunity to influenza A virus infection requires B cells but not CD8+ cytotoxic T lymphocytes. J. Infect. Dis. 183: 368-376. Sambhara, S., A. Kurichh, R. Miranda, T. Tumpey, T. Rowe, M. Renshaw, R. Arpino, A. Tamane, A. Kandil, O. James, et al 2001. Heterosubtypic immunity against human influenza A viruses, including recently emerged avian H5 and H9 viruses, induced by FLU-ISCOM vaccine in mice requires both cytotoxic T-lymphocyte and macrophage function. Cell. Immunol. 211: 143-153. Leopold, P. L., R. L. Wendland, T. Vincent, R. G. Crystal. 2006. Neutralized adenovirus-immune complexes can mediate effective gene transfer via an Fc receptor-dependent infection pathway. J. Virol. 80: 10237-10247. Chehadeh, W., P. E. Lobert, P. Sauter, A. Goffard, B. Lucas, J. Weill, M. C. Vantyghem, G. Alm, P. Pigny, D. Hober. 2005. Viral protein VP4 is a target of human antibodies enhancing Coxsackievirus B4- and B3-induced synthesis of α interferon. J. Virol. 79: 13882-13891. Muckelbauer, J. K., M. Kremer, I. Minor, L. Tong, A. Zlotnick, J. E. Johnson, M. G. Rossmann. 1995. Structure determination of Coxsackievirus B3 to 3.5 A resolution. Acta Crystallogr. D Biol. Crystallogr. 51: 871-887. Muckelbauer, J. K., M. G. Rossmann. 1997. The structure of Coxsackievirus B3. Curr. Top. Microbiol. Immunol. 223: 191-208. Portela, A., P. Digard. 2002. The influenza virus nucleoprotein: a multifunctional RNA-binding protein pivotal to virus replication. J. Gen. Virol. 83: 723-734. Hinshaw, V. S., C. W. Olsen, N. Dybdahl-Sissoko, D. Evans. 1994. Apoptosis: a mechanism of cell killing by influenza A and B viruses. J. Virol. 68: 3667-3673. Virelizier, J. L., A. C. Allison, J. S. Oxford, G. C. Schild. 1977. Early presence of ribonucleoprotein antigen on surface of influenza virus-infected cells. Nature 266: 52-54. Stitz, L., C. Schmitz, D. Binder, R. Zinkernagel, E. Paoletti, H. Becht. 1990. Characterization and immunological properties of influenza A virus nucleoprotein (NP): cell-associated NP isolated from infected cells or viral NP expressed by vaccinia recombinant virus do not confer protection. J. Gen. Virol. 71: 1169-1179.